Can't see what you want contact our custom plate service. 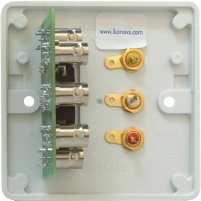 Utilising the DADO-OEM™ board with front panel HD15 for VGA and internal BNC sockets, it is designed for use with 5 core RGBHV coax cables. 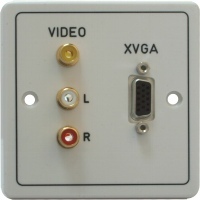 The plate is also fitted with a yellow phono socket for video as well as left and right, gold plated, phono sockets for audio all using rear panel solder connections.